Odds compilers have to work very quickly when producing a fixed iodds coupon. Mistakes do happen and once the coupon is published they cannot be changed. Reproduced below is an exact copy of an advertisement which has been appearing in the British sporting press. We have access to almost every sports betting system there is. We have studied this system and find the results very impressive. This is one of the best thought out systems we have ever seen. 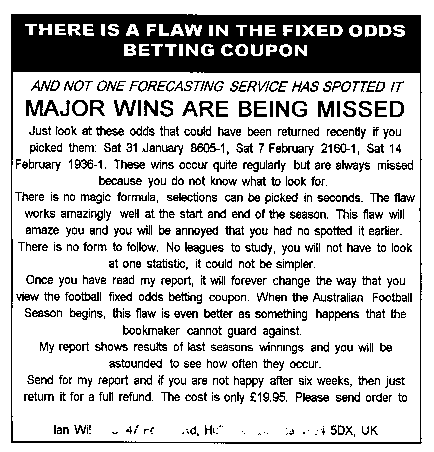 The inventor of it has included actual Fixed Odds coupons as proof of his claims. It is also available in our Football System Package. They have to set the odds in advance to make the coupons available on the Wednesday before Saturday's matches. Because they have to produce these coupons quickly they often make serious mistakes when assessing odds. BUT ONCE THEY HAVE PRINTED THE COUPONS THEY HAVE TO STAND BY THEM! This one fact alone makes football betting very different (and profitable!) from horse racing, where the bookies are constantly changing the odds, right up to the start of a race. This System makes brilliant use of this fact, and is very easy to use, without a computer. The Secret Fixed Odds System can be used on UK Bookmakers Fixed Odds Football betting. It is not designed for overseas Pools betting.